The primary role of intelligence organisations and public safety agencies encompasses protecting the lives and property of citizens. However, the urban population growth rate tends to overshadow the available security resources. Thus, the security agencies appear to be more reactive than proactive. Public safety agencies usually have a plethora of under-utilised crime incident reports at their disposal, which if efficiently analysed could reveal some previously unknown useful information. Such information reveals insights into a range of functions in a crime investigation, which can assist in determining criminal trends and in knowledge-driven decision support. This chapter provides an overview of data mining techniques and existing applications used in this domain of interest. Features of existing applications and techniques, such as exploratory basis, model selection, algorithm advancement and result summary, are compared. 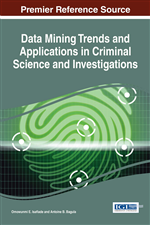 Future potential of crime data mining, and open research issues, are also discussed. Increased violent crime is becoming a threat all around the world, including South Africa (Republic of South Africa. South African Police Service, 2011). As a result, the central role of public safety authorities has been channelled toward eradicating or deterring such violent crime. More often than not, this is attributed to the urban population growth rate, that is rapid urbanisation. Figure 1 reveals a bar graph of the urban population growth rate in South Afric.a Furthermore, rapid urbanisation has been identified as a trend that would continue into the next decade (Chartered Financial Analyst Institute, 2013). While crime may not necessarily increase exponentially with a nation’s population, the total number of crimes can be contemplated to increase as the population increases. Figure 2 presents an over-crowded community that is highly susceptible to increased criminal activity. Hence, deterring crime becomes an important top priority for realising a sustainable “safe and smart” city in any nation. Consequently, proactive measures must be put in place in anticipation of an escalation of crime activities. Republic of South Africa. Trading Economics Report, 2013. A smart city is one that strategically utilizes many smart factors such as Information and Communication Technology (ICT) to increase the city’s sustainable growth and strengthen city functions, while promoting citizens’ happiness and wellness (Hafedh et al, 2012). Ensuring sustainable public safety in any country is fundamental to a “safe and smart city”. Hence, efficient or tactical crime data mining or analysis, prediction, control and prevention strategies remain a current global issue.